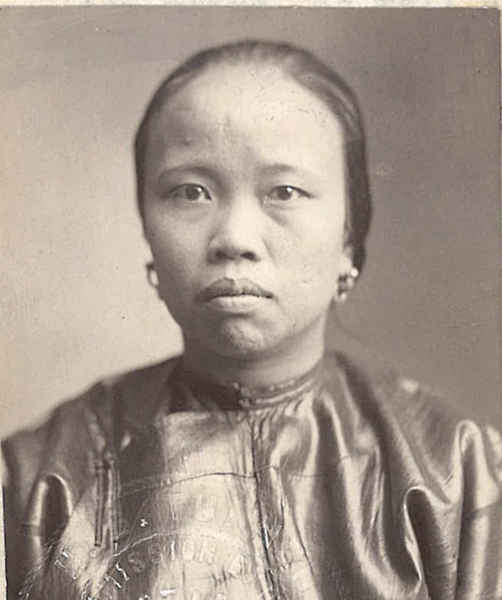 “Photo of Look See (Mrs. Chin Quong),” 1904, Chinese Exclusion Act case files, RG 85, National Archives-Seattle, Look See case file, Seattle Box 1236, 35205/1-4. Look See, wife of Chin Quong, a manager of the Wa Chong Company, 719 King Street, Seattle, Washington, made two trips in China—one in 1904 and another in 1917. After the first trip Look See was re-admitted to the United States at Port Townsend, Washington on 22 June 1905. She testified that she was thirty-six years old and first came to the United States with her sister, Mrs. Chin Gee Hee, in about 1882 or 1883 when she was around thirteen years old. When asked if she knew any white men in Seattle, she replied that she knew Mr. Whitlock, a lawyer; and three white ladies: Mrs. Hambeck, a Christian teacher; Mrs. Thomas, an old lady, also a teacher; and Mrs. Greene. Chin Kee was her Chinese witness. He testified that Look See and Chin Quong had been married according to the Chinese custom for at least twenty years; they had six children—three sons and three daughters, all born in Seattle. Her maiden name was Ah Quan. Chin Gee Hee, a merchant, labor contractor, and well-known early settler in Seattle, performed their wedding ceremony in October 1886. Look See’s husband Chin Quong testified that he had been a member of the Wah Chung (Wa Chong) firm since about 1890. There were seven partners whose capital stock equaled $60,000 [worth almost $1,600,000 in 2017]. The partners were Chin Quong (himself), Chin Quok Jon, Woo Jen, Chin Wing, Chin Wing Mow, Chin Wing Yon, Chin Yen Gee, and Chin Ching Hock. [That adds up to eight partners but the John H. Sargent, Chinese Inspector did not ask about the discrepancy.] Chin Quong was also a manager at the Wah Chung Tai Company in Butte, Montana. 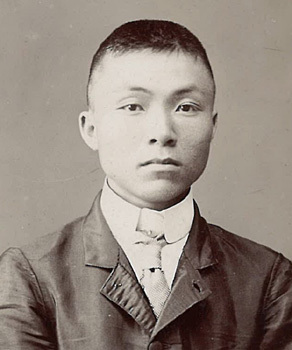 John C. Whitlock, testified that he was forty-eight years old, had lived in Seattle more than sixteen years–arriving in the spring of 1898, and since he collected the rent from the Chinese tenants of the Wah Chung building he was well acquainted with Chin Quong. Whitlock usually had to go to the building night after night to find all of the tenants. He was aware that Look See was in the detention house in Port Townsend when this testimony was taken. Whitlock, Samuel F. Coombs, Justice of the Peace; and Chin Quong all testified in affidavits in Look See’s favor in 1904 before she left for China. Look See left Seattle again in September 1916 with her sons Chin Dan and Ah Wing, and her daughter Ah Lan. She was returning in June 1917 with her son, Chin Dan, and her daughter, her daughter’s husband, Pang Chung Cheong; and their infant son. They were admitted. The Reference Sheet lists these files: RS 910 & 34,380, Look See; 35205/1-1, Archie Pang, son-in-law; 35205/1-2, Annie M. Chin, daughter; 35205/1-2, Victor Ernest Pang, grandson; 35205/1-5, Chin Dan, son; 36918/3-8, Chin May Goon, daughter of husband by secondary wife; 40231/2-16, Anna Pang (Annie M. Chin) Chin May Young, daughter; RS 2033, Chin Quong, husband.